In season now! All the fresh, juicy tomatoes and ripe, luscious avocados inspired this yummy, Mexican-influenced summer salad. I can’t stop eating this. It’s so easy, I have prepared it just about every week this summer so far. You may notice that this salad has no added oil. That is not a mistake. The avocado itself provides enough fat to “lubricate” the salad. Although avocados are high in fat, (about 85% of their calories come from fat), these are health-promoting monounsaturated fats. So there’s no need to avoid eating avocados because of their fat content. In fact, the US National Health and Nutrition Examination Study (NHANES 2001-2006), found that people who ate avocados were lower in weight and lower in body mass index than those who didn’t. helping your body absorb carotenoids. Carotenoids are the colorful plant pigments that your body can turn into vitamin A. They help protect your cells from the damaging effects of free radicals and enhance your immune response to infection. Carotenoids have also been said to help prevent some forms of cancer and heart disease. Not only do avocados help you absorb carotenoids, but avocados themselves also contain a number of important carotenoids and other phytonutrients. But take note: How you peel your avocado can make a difference! Researchers at UCLA found the most carotenoids in avocados directly beneath the skin in the dark-green flesh. For this reason, the California Avocado Commission recommends the so-called “nick-and-peel” method. Cut the avocado in half, remove the seed, then cut each half in half to produce quarters. Then, you can use your thumb and index finger to grip the edge of the skin on each quarter and peel it off, just as you would do with a banana skin. The final result is a peeled avocado that contains most of that dark green flesh that is so rich in carotenoid antioxidants! A real power lunch for the summer months. 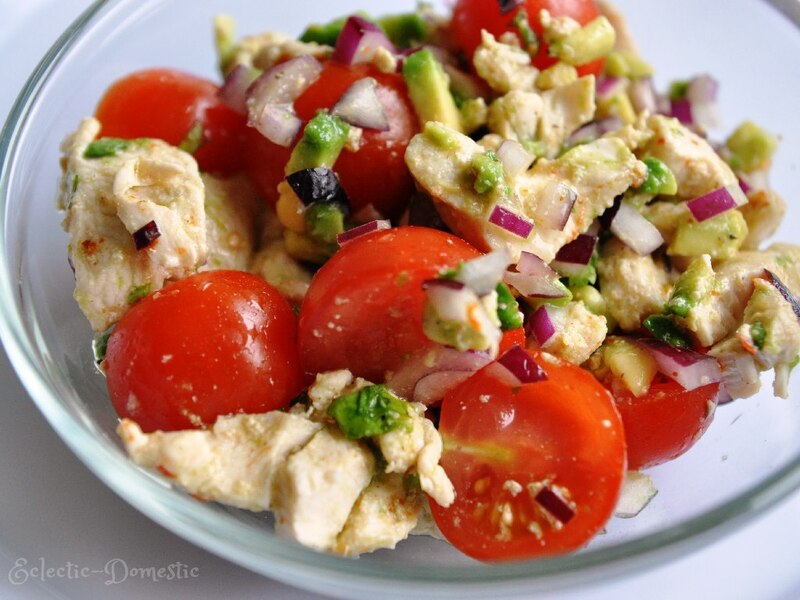 Once the chicken has cooled, place it into a bowl with cherry tomatoes, red onion, and avocado. Toss immediately with lemon juice to prevent avocado from browning. Add salt, pepper, and cilantro to taste. Serve on a bed of lettuce—or just gobble it straight up. If you're not paleo, you could also serve this in a tortilla wrap. Tip: squeeze a bit of lemon juice on the other half of your avocado and wrap it tightly in plastic wrap to keep it from browning. Store it in the refrigerator and use within a day. That’s great. Glad you liked it. Thanks for letting me know!